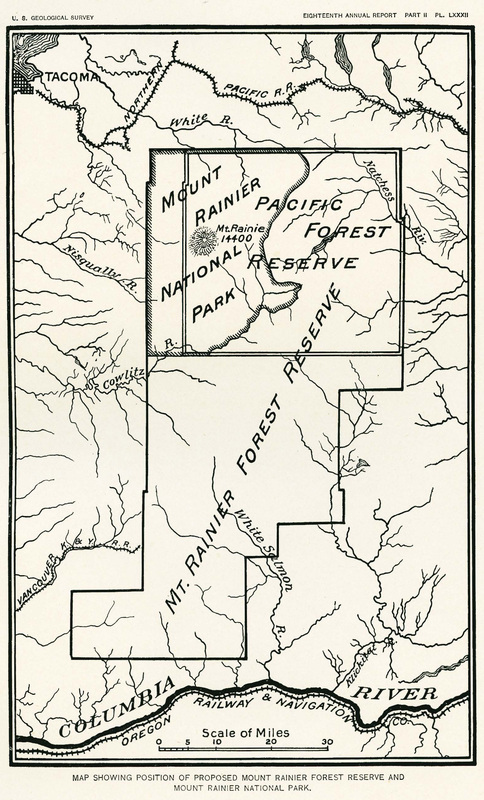 In order to preserve vast forests of the western states, the Forest Reserve Act was passed into law in 1891. This enabled the President to set aside tracts of forest and lands from private timber and logging activities. While the work for the designation of Mt. Rainier NP was going on, the President set aside forests in and around Mt. Rainer as a forest reserve, full text below. To set apart certain lands, now known as Pacific Forest Reserve, as a public park, to be known as the Washington National Park. Beginning at the southwest corner of township thirteen north, range fiften east, of the Willamette bas and meridan; then northerly along hte surveyed and unsurveyed range line between ranges, fourteen and fifteen east, subject to the proper easterly or westerly offset on the fourth standard parallel north, to the point for the northeast corner of township eighteen north, range fourteen east; thence westerly along the unsurveyed township lie between townships eighteen and nineteen north, to the southeast corner of township nineteen north, range seven east; thence southerly along the unsurveyed line between ranges seven and eight east, subject to proper easterly or westerly offsets on the township line between seventeen and eighteen north, and the fourth standard parallel north, to the point for the southwest corner of township thirteen north, range eight east; thence easterly along the unsurveyed township line between townships twelve and thirteen north, to the southwest cornder of township thirteen north, range fifteen east, the place of beginning, and which were reserved from entry or settlement and set apart as public reservation by proclamation of the President o the twentieth day of February in the year of our Lord one thousand eight hundred and ninety-three, and of the independence of the United States the one hundred and seventh, are hereby dedicated and set apart as a public park, to be known and designated as the Washington National Park, for the benetif and enjoyment of the people; and all person who shall located or settle upon or occupy the same, or any part thereof, except as hereafter provided, shall be considered tresspassers and be removed therefrom. Sec. 2. That said public park shall be under the exclusive control of the Secretary of the Interior, whose duty it shall be to make and publish, as soon as practicable, such rules and regulations as he may deem necessary or proper for the care and management of the same. Such regulations shall provide for the preservation from injury and spoilation of all timber, mineral deposits, natural curiosities or wonders within said park and their retention in the natural condition. The secretary may , in his discretion, grant leaases for building purposes, for term not exceeding tn years of small parcels of ground at such places in said park as shall require the erection of buildings for accommodation of visitors, all proceeds of said leases, and other revenues that may be derived from any source connected with said park, to be expected under his direction in the management of the same and the construction of roads and bridle paths therein. He shall provide against wanton destruction of the fish and game found within said park, and against their capture or destruction for the purposes of merchandise or profit. He shall also cause all persons trespassing upon the same after the passage of this act to be removed therefrom, and generaly shal be authorized to take all necessary measures as shall be necessary or proper to fully carry out the objects and purposes of this act. Beginning at the southeast corner of township four (4) north, range (9) east, Willamette base and meridian, Washington; thence northerly along the range line between ranges nine (9) and ten (10) east, subject to the proper offset on the first (1st) standard parallel north, to the northwest corner of township six (6) north, range ten (10) east; thence easterly along the township line to the northeast corner of said township; thence northerly along the range line to the northwest corner of township seven (7) north, range eleven (11) east; thence easterly along the township line between townships seven (7) and eight (8) north to the northeast corner of township seven (7) north, range twelve (12) east; thence northerly along the surveyed and unsurveyed range line between ranges twelve (12) and thirteen (13) east, subject to the proper offset on the second (2nd) standard parallel north, to the northwest corner of township eleven (11) north, range thirteen (13) east; thence easterly along the surveyed and unsurveyed township line between townships eleven (11) and twelve (12) north to the southwest corner of township twelve (12) north, range fifteen (15) east; thence northerly along the surveyed and unsurveyed range line between ranges fourteen (14) and fifteen (15) east, subject to the proper offsets on the third (3rd) and fourth (4th) standard parallels north, to the point for the northeast corner of township eighteen (18) north, range fourteen (14) east; thence westerly along the unsurveyed and surveyed township line between townships eighteen (18) and nineteen (19) north to the southwest corner of township nineteen (19) north, range seven (7) east; thence southerly along the surveyed and unsurveyed range line between ranges six (6) and seven (7) east, subject to the proper offsets on the township line between townships seventeen (17) and eighteen (18) north, and on the fourth (4th), third (3rd)-, and second (2nd) standard parallels north, to the point for the northeast corner oftownship five (5) north, range six (6) east; thence westerly along the unsurveyed township line between townships five (5) and six (6) north to the southeast corner of township six (6) no1'th, range four (4) east; thence southerly along the unsurveyed range line between ranges four (4) and five (5) east, subject to the proper offset on the first (1st) standard parallel north to the point for the southwest corner of township four (4) north, range five (5) east; thence easte:rly along the unsurveyed and surveyed township line between townships three (3) and four (4) north to the southeast corner of township four (4) north, range nine (9) east, the place of beginning. Provided, That this exception shall not continue to apply to any particular tract of land unless the entryman, settler, or claimant continues to comply with the law under which the entry, filing, settlement, or location was made. The tract thus reserved includes the Cascade Range in the southern part of Washington. The Government land surveys which partly bound and fix the location Of the reserve have in western Washington been made from theWillamette meridian and in eastern Washington from the Columbia guide meridian. The sum of the discrepancies between them falls in the unsurveyed mountainous region partly covered by the reserve, and for this and other reasons the area of the reserve is 2,146,600 acres, and not 2,234,880 acres, as would be implied by the above description if all the townships were of full size. Of this total area 890,440 acres, or 41.4 per cent, lies on the eastern slope, and 1,256,160 acres, or 58.6 per cent, on the western slope of the mountains. All of the eastern slope and the greater portion of the western drain into Columbia River, the tributary streams being the Cowlitz, Cispus, Lewis, Washougal, Rock, Wind, Little White Salmon, White Salmon, Klickitat, Atanum, Tieton, Naches, and Yakima rivers. The total watershed area of these streams is 1,794,600 acres, or 83.6 per cent of the reserve. The remainder, ~52,000 acres, or 16.4 per cent, is drained into Puget Sound, the tributary streams being the White, Puyallup, and Nisqually rivers. Within the reserve are foul' mountain peaks or domes of unusual magnitude: Mount Rainier, 14,526 feet; Mount Adams, 12,470 feet; Goat Mountain, 8,500 feet, and Mount Aix, 7,623 feet. Of these Mount Rainier and Mount Aix are not on the summit line, but like Mount St. Helens, Mount Stewart, and Mount Baker, all in Washington, stand on one side or the other of the range. The Act is excerpted from "Short History of Mount Rainier National Park", by Robert N. McIntyre, pages 84-86, unpublished manuscript of National Park Service, 1952. The Proclamation and description is excerpted from "Mount Rainier Forest Reserve, Washington", by Fred G. Plummer, pages 87-88, in the "Twenty-First Annual Report of the United States Geological Survey To the Secretary of the Interior, 1899-1900", in seven parts: Part V, Forest Reserves. Walcott, Charles D., director.